Download the Outcomes of Alcohol and Other Drug Dependency Treatment Research Update. In order to address the impact of our services on patients' long-term abstinence and well-being, the Hazelden Betty Ford Foundation collects various outcome measures from selected programs on an ongoing basis. These outcomes are used by the Hazelden Betty Ford Foundation to determine the efficacy of various services and clinical techniques, and to provide invaluable insight into how we can continuously improve the programs we offer to our patients and their families. The Hazelden Betty Ford Foundation patient outcomes research is designed, carried out and disseminated by the Foundation's Butler Center for Research (BCR). When patients enter one of the clinical programs currently being tracked for patient outcomes, they are asked to sign a release form at the beginning of treatment that allows the BCR to contact them once they discharge. From July 2016 through June 2017, tracked clinical programs included the residential programs at Center City and Plymouth, Minnesota, and Rancho Mirage, California, as well as the intensive outpatient program at Chicago, Illinois. Callers from the BCR reach out to patients at one, three, six, nine and 12 months after discharge to ask how they are doing and to collect information about patients' recovery and overall quality of life. From July 1, 2016 to June 30, 2017, there were 1,870 patients who were eligible for participation in Hazelden Betty Ford Foundation's outcomes research. Response rates varied by follow-up period, but a summary of response rates is included in Figure 1. While the BCR works tirelessly to get as many responses from eligible patients as possible, it is sometimes impossible to reach patients in order to complete their surveys. Other reasons include patients' requests to be excluded from the research or their subsequent return to treatment. Response rates for each survey are generally at or above 70% of eligible patients, which suggests that the information collected through the surveys is sufficiently representative of Hazelden Betty Ford Foundation patients. Given that Hazelden Betty Ford Foundation treatment programs emphasize the importance of abstinence from alcohol and other drugs in order to maintain lifelong recovery from chemical dependence, one of the simplest and most useful indicators of treatment success is the percentage of patients who report continuous abstinence from alcohol and other drugs at each survey period (individuals who have not used alcohol and/or other drugs at any time since discharge from the Hazelden Betty Ford Foundation). 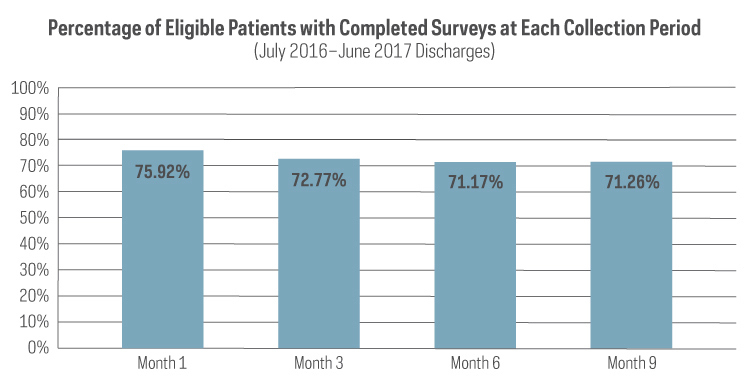 Surveys from patients discharged from tracked programs between July 2016 and June 2017, indicate that the majority of respondents remained continuously abstinent from alcohol and other drugs throughout the nine months following their discharge from treatment (see Figure 2). Specifically, 88.64% of respondents reported continuous abstinence from alcohol one month after discharge, 76.29% reported abstinence at three months, 69.08% reported abstinence at six months and 70.18% reported abstinence at nine months. 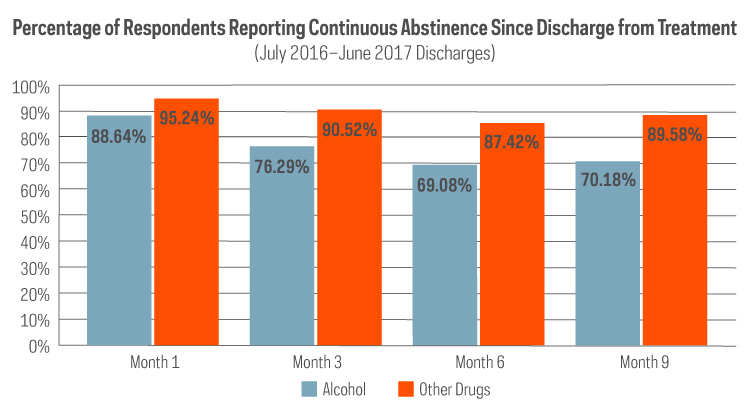 Abstinence from other drugs was reported by nearly all respondents eligible for each follow-up survey between July 2016 and June 2017; the overall percentage of respondents who reported continuous abstinence from all other drugs (not including alcohol) was between 85% and 95% for all survey periods up through nine months after discharge. Quality of life is an undoubtedly critical aspect of successful long-term recovery, but its subjective nature can make it difficult to measure effectively. In order to maximize the level of consistency and objectivity in our own patients' reported quality of life during their recovery, the BCR uses a validated quality of life instrument for each patient—the World Health Organization's Quality of Life Brief Version (WHOQOL-BREF). The WHOQOL-BREF has been tested on thousands of individuals across several countries,1 and its scores therefore offer a more standardized understanding of how Hazelden Betty Ford Foundation patients are doing on a scale of zero to 100. 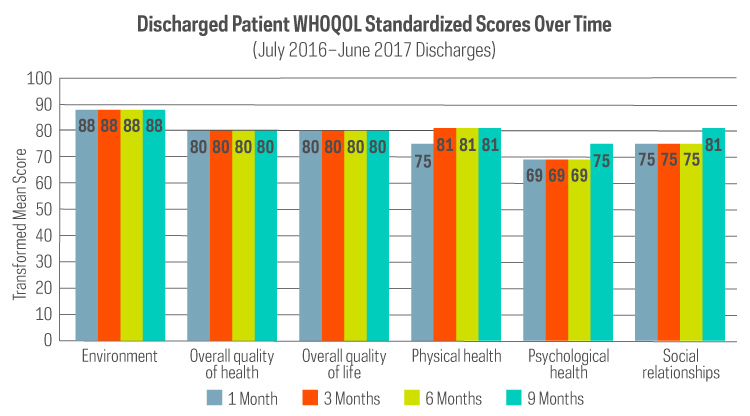 Overall, patients demonstrate strong quality of life ratings after discharge from residential treatment, with mean increases in physical health, psychological health and social relationships over time (see Figure 3). Overall quality of life and health standardized scores show that Hazelden Betty Ford Foundation patients are consistently in the 80th percentile based on the normative population of the instrument. The staff of the Butler Center for Research is pleased to be able to support the mission and services of the Hazelden Betty Ford Foundation through ongoing patient outcomes research. Based on the regular surveys we conduct with our patients, we have been able to determine that, overall, our programs result in positive outcomes—in relation to alcohol and drug recovery, as well as overall quality of life. The majority of patients who discharge from Hazelden Betty Ford Foundation residential programs report continuous abstinence from alcohol and other drugs, and demonstrate favorable quality of life scores. Patient outcomes will continue to play a significant role in the Foundation's efforts to offer only the most efficacious techniques and services to the individuals and families who participate in clinical programming. Clinical programs at the Hazelden Betty Ford Foundation rely heavily on the influence of evidence-based practices (EBPs), which are clinical and professional techniques based on both scientific and local evidence.2 Scientific evidence is collected through ongoing and careful review of the scientific literature, but local evidence requires data collection from the actual patients and families who are directly impacted by Hazelden Betty Ford Foundation programs. The staff at the Butler Center for Research organize and manage ongoing outcomes research that informs all major clinical programs, providing the required local evidence to support or improve therapeutic services carried out by clinical staff. The Foundation is an industry leader in patient outcomes collection, and has developed a unique and effective data collection process that allows us to reliably implement clinical programming based on the direct impact our services have on clients. Tracked programs are rotated regularly, and combinations of clinical programs are noted in patient outcomes records in order to most broadly determine the efficacy of services. A number of patient-specific variables are also included in outcomes research to best make treatment recommendations for future clients based on their individual characteristics. Question: Recovery is such a complex and unique experience; how can research on outcomes reflect all the differences patients may face in their first year after discharge? Answer: While research must consistently balance the level of detail with the level of generalizability for any given experiment, there are ways to gain valuable insight without completely sacrificing detail or generalizability. The use of clear, straightforward variables related to abstinence (such as a measure of how many patients remain consistently abstinent after discharge) offers information that is simple enough to generalize across many different areas, but fails to grasp some of the more complex and nuanced elements of recovery. By also incorporating a measure of quality of life, a more personalized aspect of recovery can be easily translated into a useable metric that can be applied to many patients. Since quality of life is a variable that can be tricky to define due to its broad interpretation, selecting an instrument that has been implemented, measured and standardized across many people from many different backgrounds ensures consistency without losing detail. Patients: For individuals who have completed treatment, outcomes research is a wonderful opportunity to directly share feedback and experiences that can have a significant impact on future patients and the therapies they receive. Results from patient research can also be a very useful tool for individuals who are considering going into treatment, as these findings shed a great deal of light on how effective a program may be. If you plan to use patient outcomes research to guide your decision to select a program or facility, be sure the research includes critical "background information," such as response rates, number of patients included and what specific variables were collected. Clinicians: Patient outcomes are a very effective means of assessing how successful a clinical program or therapy is over a large number of participating patients. Seeking out local evidence from your own clinic, in addition to regular review of the scientific literature, is necessary for continuous improvement, and will ensure that your practice incorporates emerging techniques while also allowing you to perfect the delivery of therapeutic modalities for your specific client population. 1. World Health Organization. (1998). Development of the World Health Organization WHOQOL-BREF quality of life assessment. Psychological Medicine, 28(3), 551-558. 2. Rousseau, D. M., & Gunia, B. C. (2016). Evidence-based practice: The psychology of EBP implementation. Annual Review of Psychology, 67, 667-692.